In 1875, Queen Victoria granted a parcel of land for the purposes of building a church and a school for the use of the commoners of West End, Esher. Ownership of the land passed to the Church of England who in 1879 oversaw the building of St George's Church. In the same year, Mrs Anne Bailey of “Stoney Hills” provided an endowment to build a C of E primary school in memory of her huband, building permission being granted on the condition that a religious service be held in it at least once a week. 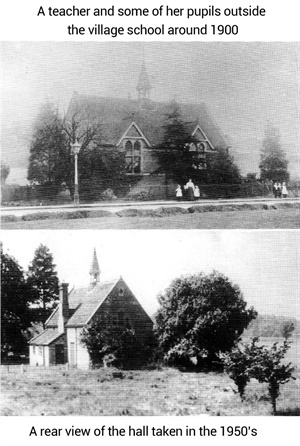 Once the new schools were established in Esher Green, Milbourne Lane and More Lane for the education of Esher’s children, the schoolhouse in West End became a social centre for the village. In 1970, the building was converted to a village hall, having surmounted the legal requirement to hold the weekly religious service. A Lease and Trust Deed was made on 26 November 1971 between the Rector and Church Wardens of Christ Church, Esher (the Lessors) and Matthijs Otto Eermans together with Anthony George Drummond Collis (the Lessees). The Lessees would thereby become Trustees of the property which would be used for the purposes of a village hall for the use of the inhabitants of West End (Esher). The Trustees were required to vest the lease with the Charities Commission making West End Village Hall a registered charity. Thereafter, the Trusteeship would be transferred to a Management Committee comprising of trustees both elected and appointed by designated organisations based in the village. In 2002, the Trustees secured Lottery Funding in order to build an extension to the hall. The extended area provides a foyer, new toilets and an enlarged kitchen. The hall, in its enhanced form, continues to be widely used and the facility remains highly regarded by the community.